Most Americans support paid family and medical leave. But when it comes to what benefits or work arrangements are or would be most helpful to them personally, flexibility is valued as much as paid leave. About four-in-ten workers who are not self-employed (43%) say their employer offers paid leave following the birth or adoption of a child, to care for a family member with a serious health condition or to deal with one’s own serious condition. This is significantly lower than the share of workers who say their employer offers them health insurance (78%); paid time off for vacations, doctor’s appointments, or to deal with minor illnesses (74%); or a 401(k) or other retirement savings program (71%). Still, American workers are largely satisfied with the benefits their employers provide: About seven-in-ten (69%) say they are at least somewhat satisfied with their benefits, including 27% who are very satisfied. And roughly two-thirds say their employer cares a great deal (22%) or a fair amount (45%) about the personal well-being of their employees. When asked which of five benefits or work arrangements is or would be the most helpful to them personally, about three-in-ten Americans who are either employed or looking for work (28%) cite having flexibility to choose when they work, provided they put in their required hours. About as many (27%) say paid leave for family or medical reasons would be the most helpful. Roughly one-in-five (22%) point to flexibility to work from home, while fewer say paid time off for a routine doctor’s appointment or to deal with minor illnesses (12%) or knowing their hours and work schedule well in advance (10%) would be the most helpful benefit or work arrangement to them. The share saying paid leave for family or medical reasons would be the most helpful benefit or work arrangement to them is fairly consistent across demographic groups, but those who have taken or have needed or wanted to take time off in the past two years for these reasons are more likely than those who have not been in this situation to say this would be particularly helpful. 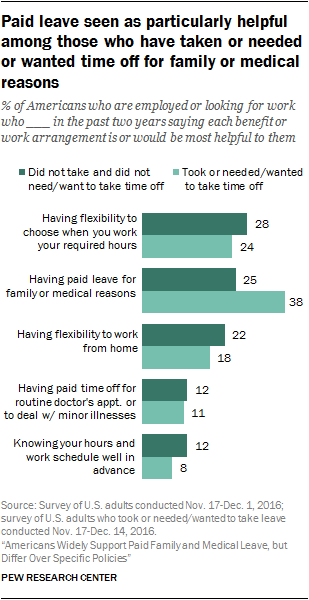 In fact, among people who have taken or have needed or wanted to take leave recently, having paid leave for family or medical reasons is cited more than any of the other benefits or work arrangements listed as the most helpful: 38% say having paid leave would be the most helpful benefit or work arrangement for them personally, followed by having flexibility to choose their work schedule (24%) or to work from home (18%), having paid time off for a routine doctor’s appointment or to deal with minor illnesses (11%), and knowing their hours and work schedule well in advance (8%). While most Americans believe employers that pay their employees when they take leave from work for family or medical reasons are more likely to attract and keep good workers, and many say this would be a helpful benefit to them personally, the survey reveals that one-in-five workers who are not self-employed are not sure whether or not their own employer offers this benefit to them. Far fewer say they aren’t sure if their employer offers paid time off for vacations, routine doctor’s appointments or to deal with minor illnesses (9%); if their employer offers a 401(k) or other retirement savings program (8%); or if they have access to employer-provided health insurance (6%). About four-in-ten (43%) employed Americans say their employer offers them paid leave, separate from vacation, sick leave or paid time off (PTO), following the birth or adoption of a child, to care for a family member with a serious health condition or to deal with their own serious condition; 36% say their employer does not offer them this benefit. The share of employed Americans who report that they have access to paid family or medical leave provided by their employer is considerably higher than that reported by the U.S. Bureau of Labor Statistics (BLS), which bases its estimates on compensation information provided by employers. 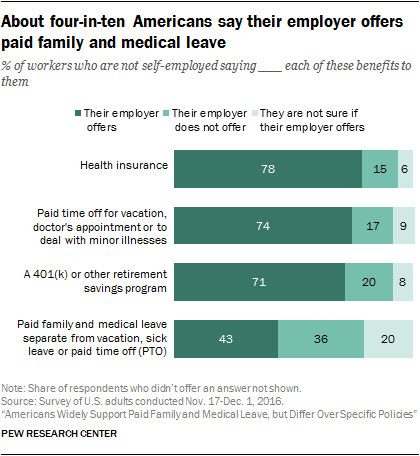 Yet, consistent with BLS statistics, 13% of Pew Research Center survey respondents who have taken time off from work for family or medical reasons in the past two years say they received pay as part of family or medical leave benefits paid by their employer, separate from vacation, sick leave or PTO. This suggests that some workers who think they have access to employer-paid family and medical leave may not, in fact, have access to this benefit. Workers employed by government (53%) or by nonprofit organizations (49%) are more likely than those employed by private, for-profit companies (40%) to say their employer offers them paid family or medical leave. It is worth noting, however, that among those who have taken paid time off from work for these reasons in the past two years, those who were employed by a private, for-profit company were somewhat more likely than those who were employed by government or by a nonprofit organization to say at least some of their pay came from family or medical leave benefits provided by their employer. Workers with at least a bachelor’s degree (52%) are significantly more likely than those with some college (38%) or with a high school education or less (37%) say this benefit is available to them through their employer. While fewer than half of all workers who are not self-employed say their employer provides paid family and medical leave separate from vacation, sick leave or PTO, solid majorities say their employer offers health insurance (78%), paid time off for vacations, doctor’s appointments, or to deal with minor illnesses (74%), or a 401(k) or other retirement savings program (71%). As is the case with paid leave, those with at least a bachelor’s degree are more likely than those with less education to say they have access to each of these benefits. About seven-in-ten workers who are not self-employed (69%) say they are at least somewhat satisfied with the benefits their employer provides, including 27% who say they are very satisfied. Three-in-ten are either somewhat (19%) or very (11%) dissatisfied with their benefits. Most (66%) also say their employer cares a great deal or a fair amount about the personal well-being of their employees, while a third say their employer does not care much or at all. Those with annual household incomes below $30,000 are less likely than those with higher incomes to say they are at least somewhat satisfied with their benefits and to say their employer cares at least a fair amount about the personal well-being of its employees. About three-quarters (76%) of those with household incomes of $75,000 or more express satisfaction with their benefits, as does a somewhat narrower majority (64%) of those with household incomes between $30,000 and $74,999. In contrast, among those with incomes below $30,000, about as many say they are satisfied (49%) as say they are dissatisfied (48%) with the benefits their employer offers. Similarly, while seven-in-ten employed Americans in the higher income group and 65% of those in the middle income group say their employer cares a great deal or a fair amount about their employees’ well-being, about half (52%) of those with annual household incomes below $30,000 say the same. Those who say their employer offers them health insurance, retirement savings programs, sick leave, vacation or personal time off, or paid family and medical leave are more likely than those who say they do not have access to each of these benefits – or are not sure if they do – to express satisfaction with their benefits overall and to say their employer cares about the personal well-being of their employees. 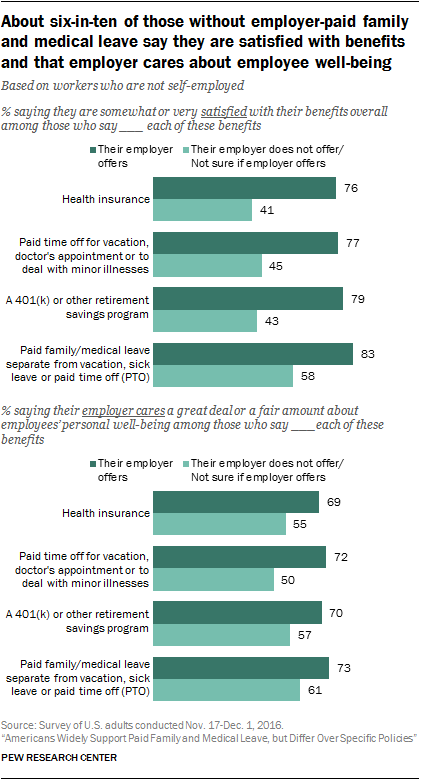 Still, at least half or more of those who do not receive each of these benefits or are not sure say their employer cares about the personal well-being of their employees a great deal or a fair amount, and many say they are at least somewhat satisfied with their employer benefits.